MSIL (Maruti Suzuki India Limited) is the largest car maker in the country, which has a lot of splendid vehicles in their stable. Among them, Maruti Alto K10 is a popular hatchback, whose facelifted version is launched with a few changes. 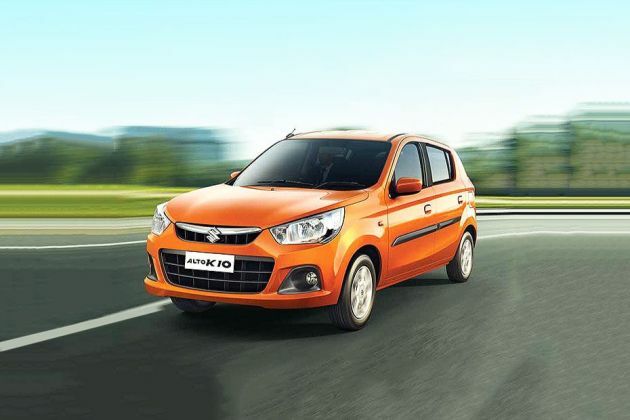 It is introduced with a budget friendly price tag and it competes against the likes of Chevrolet Spark, Hyundai Santro Xing, Datsun Go and Hyundai Eon. It has several trim levels, of which, Maruti Alto K10 LX is the entry level variant. It is fitted with a 1.0-litre petrol engine, which can displace 998cc. This engine is mated with a five speed manual transmission gear box, which allows the hatchback to break the 60 kmph speed barrier in just 5.3 seconds. The braking and suspension mechanism of this model series is quite proficient. Its exteriors are modified with redesigned radiator grille, headlight cluster and bumper, which makes it more attractive. Apart from these, the interiors also get some changes like revamped dashboard with rectangular AC vents, 3-spoke steering wheel and a new instrument panel. On the whole, it is a perfect vehicle with standard comfort features, good engine performance and reasonable price range. It is being offered with a standard warranty of two years or 40000 Kilometers, whichever comes first. At the same time, the buyers can also avail an extended warranty of one year or 60000 Kilometers at an additional cost paid to authorized dealers. This small car is designed with utmost care along with a number of striking features. It has a revised radiator grille, which is embedded with a prominent company logo in the center. It is surrounded by a neatly carved headlight cluster that is incorporated with bright clear lens lamps and side turn indicator. The bumper is garnished in black color and houses an air intake section for cooling the engine. Its windscreen is integrated with a set of wipers and bonnet has a couple of visible character lines. Coming to its side profile, it is dominated by character lines and black finished door handles. It has driver side external rear view mirror, which is garnished in black color. The neatly carved wheel arches are fitted with a robust set of 13-inch steel wheels, which are covered with 155/65 R13 sized tubeless radial tyres. The rear end has body colored bumper and a stylish tail light cluster. Its curvy boot lid is fitted with black colored strip and embossed with variant badging. The windshield is integrated with a centrally located high mounted stop lamp. At present, it is being offered with six exterior paint options like Silky Silver, Fire Brick Red, Superior White, Granite Grey, Cerulean Blue and Tango Orange. The internal section of this Maruti Alto LX trim is incorporated with well cushioned seats covered with fabric upholstery and integrated head restraints. They provide ample leg space for all passengers. Its dashboard is equipped with a few features like a 3-spoke steering wheel, a new instrument panel, a glove box and redesigned AC vents. The instrument panel is integrated with a few functions like speedometer and dial-type climate control, which adds to the convenience of the driver. There are a few utility features provided inside the cabin like cup holders, 3-position cabin lights, sun visors. This variant is powered by a 1.0-litre petrol engine, which comes with a displacement capacity of 998cc. It is incorporated with a multi point fuel injection supply system, which allows the hatchback to deliver a maximum mileage of 24.07 Kmpl on the bigger roads. At the same time, it gives out a minimum 20 Kmpl within the city traffic conditions. This DOHC based power plant has the ability to churn out a maximum power of 67.1bhp at 6000rpm in combination with a peak torque output of 90Nm at 3500rpm. It is coupled with a five speed manual transmission gearbox, which sends the engine torque to its front wheels. This three cylinder based engine can achieve a maximum speed in the range of 135 to 145 Kmph. It has the ability to cross the speed barrier of 60 Kmph from a standstill in close to 5.3 seconds, which is rather good. Its front axle is assembled with a gas filled McPherson strut, while the rear axle gets a 3-link rigid axle suspension mechanism, which helps to keep the vehicle well balanced. On the other hand, the front wheels are fitted with a set of ventilated disc brakes and the rear ones are paired with drum brakes, which delivers superior stopping power. The car maker has also incorporated a highly responsive steering system, which supports a minimum turning radius of just 4.6 meter. This Maruti Alto K10 LX trim is equipped with quite a few sophisticated features. It has an efficient air conditioning unit including a heater, which helps to keep the entire cabin pleasant. It is bestowed with some essential features such as fuel lid opener, rear seat backrest with folding function, internal room lamp, rear assist grips and manual central locking. Apart from these, it also has a speedometer with amber color illumination, molded door trims, inside door handles, cup holders in floor console and a stylish gear shift knob. The car maker is offering this trim with a few standard safety features, which provides good protection to the occupants. The list includes three point front and rear seat belts along with lap belt in middle. In addition to these, it is also equipped with an engine immobilizer, headlight leveling device, a centrally located high mount stop lamp, dual horn and driver's side rear view mirror. It is built with high strength steel material featuring side impact beams and energy absorbing crumple zones, which protects the passengers in case of any accidents. 1. Improved fuel economy adds to its advantage. 2. Budget friendly price tag is an advantage. 1. Lower ground is a minus point. 2. Many more comfort and safety features can be added.